This women’s long sleeved casual shirt is a great accompaniment for denim jeans and skirts. It features a flattering round neckline and a fitted bodice that buttons down the front. 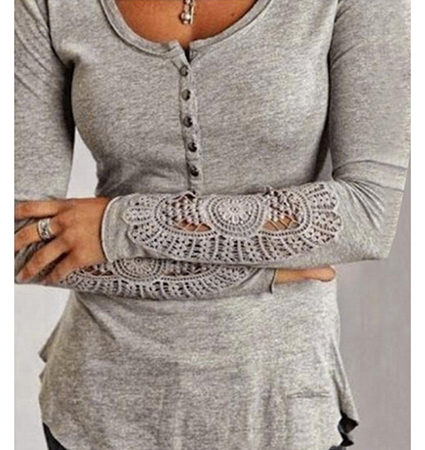 The sleeves are long and have beautiful lace cutouts on the lower portions of the arms. This shirt comes in six incredible color options. Select your favorite from gray, blue, black, navy, white or beige. This is a machine washable garment that may also be tumbled dry on a low heat setting. It is available for purchase in sizes Small, Medium, Large and Extra Large.